Had a fun game of X Wing at Garrison last night. I felt very sorry for Adam though. In the first turn of shooting I rolled 10 attack dice against his B Wing, he rolled no evades and the B Wing went down. He did one shot Howlrunner later though with Chewie. During the evening I was asked to make some more asteroids for demo games at Vapnartak next month. So tonight, flight stands were ordered and I set to some off cuts of punk foam with my foam cutter. 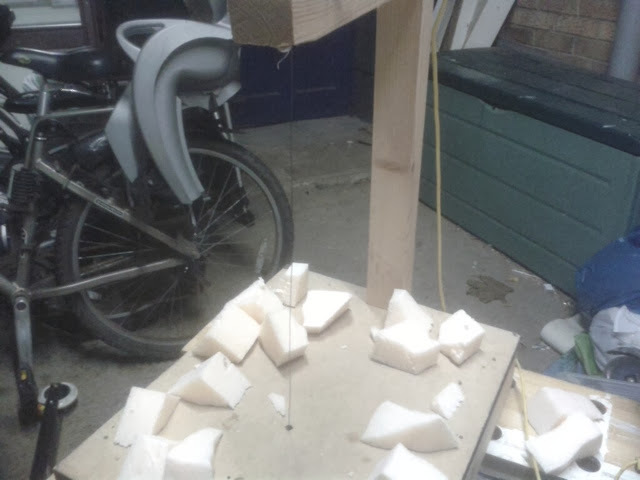 Polystyrene fumes are not good for you so cut the foam in a well ventilated area. 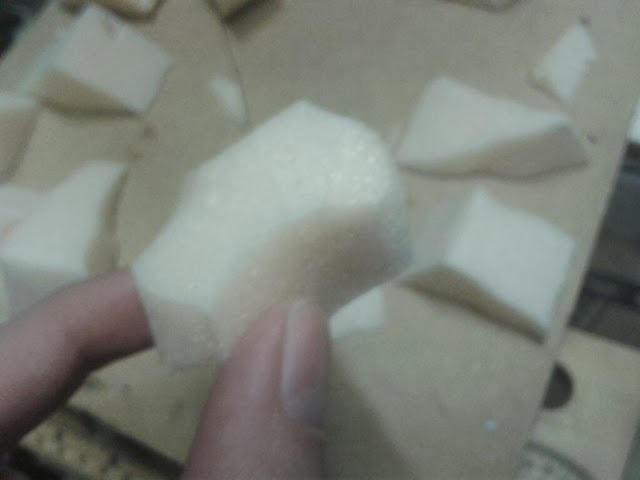 The pieces of foam need to be small, as the asteroid templates inthe game aren't huge. 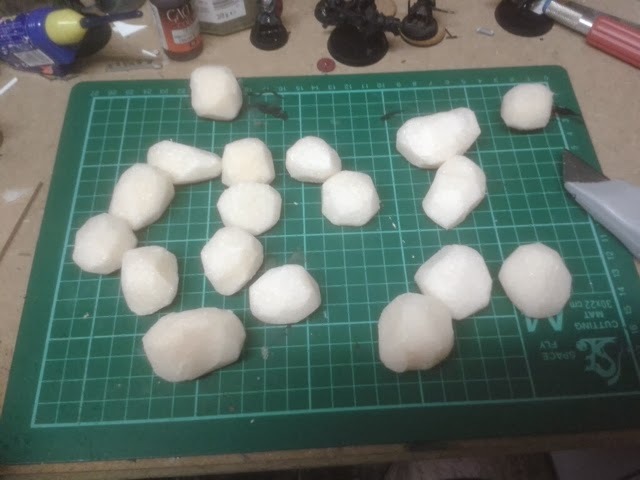 Once I had 18 pieces cut (3 sets) I shaved them all into more rock like shapes using a knife with a fresh blade. 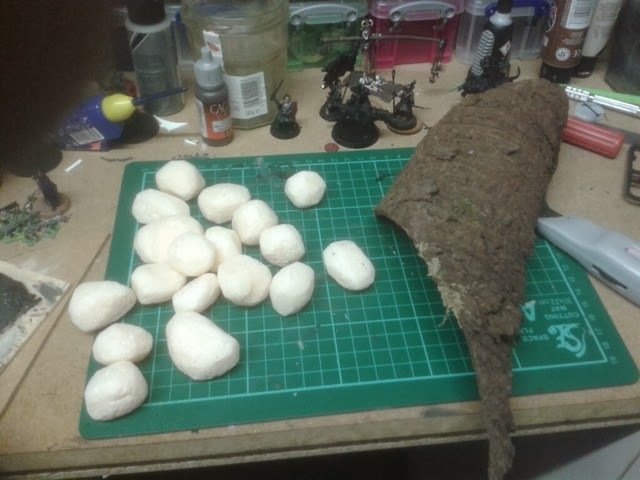 To give them some more texture I then rubbed them all on a piece of bark. You can just make out the difference in the pictures, but it's definitely obvious in real life. Next up will painting with textured paint. For those of you who are only interested in things Middle Earth (yes Llama I'm talking to you!) I'm still going on the elves, but the only change is an undercoat on the boots. I'm sorry it's been a busy week. So was the bark sources specifically or did you have it lying around and think it would be good to use? Is a strip of bark an essential item for every hobbyist's toolbox? I had the bark lying around. I could have used rock but it was cold and wet outside. Either would give a good texture.